Implementing an electronic health records (EHR) system provides medical practitioners numerous incentives. First and foremost, it is a win-or-lose scenario by federal mandate: health care providers showing meaningful use of technology to provide EHR are eligible for receiving up to $44,000 per physician under Medicare or up to $65,000 over six years under Medicaid. Those who fail to do so by 2015 will see decreased reimbursements for patients covered by those programs. These provisions were set in place by the Health Information Technology for Economic and Clinical Health (HITECH) Act in 2009. Aside from regulatory reasons, migrating to electronic records saves time, office space, and management costs. Most of all, patients will come to expect fast, secure retrieval of their medical information. While some medical practitioners are choosing to migrate a little at a time—perhaps setting per day goals , or scanning records as patients are seen—this can take its toll on the doctor’s day-to-day workflow. Some doctors have relegated a nurse or dedicated office personnel to undertake this necessary task. “My contention is that it’s easier to scan almost all, store original, and then destroy per state law,” says Matt Levin, MD, of Monroeville, Pennsylvania. A well-established medical practice may have walls of thick patient records containing years of office encounters, labs, studies, notes, and artifacts. This level of back-file conversion can be a daunting process, and makes a mid- to high-volume document scanner an essential tool for tackling EHR implementation. When choosing a scanner for the job, there are several things for a medical practitioner to take into consideration. Imaging speed—measured in the number of pages per minute (ppm) a scanner can process—is a primary consideration for a migration project. An automatic document feeder is an essential component that helps cut down time required for the task. Maximum daily volume should also be considered. Scanner models have different recommended maximum per-day usage which should not be exceeded if at all possible. The model that you should choose depends on the scale of the project, the time you’re allotting to it, and the approach you’re taking—whether you’re doing it all at once, little by little, or in fits and bursts whenever there’s time. All health care professionals and organizations should understand that the way patient health records are scanned and stored are subject to HIPAA rules. The letter of the law suggests that providers must have a documented plan in place with the appropriate safeguards to protect the privacy of personal health information. In most cases, HIPAA compliance comes as a result of ensuring only qualified individuals can come into contact with patient records. In many cases, incorporating your scanner into a computer network so it requires a level of authentications is a good way to ensure your internal HIPAA safeguards are enforced. 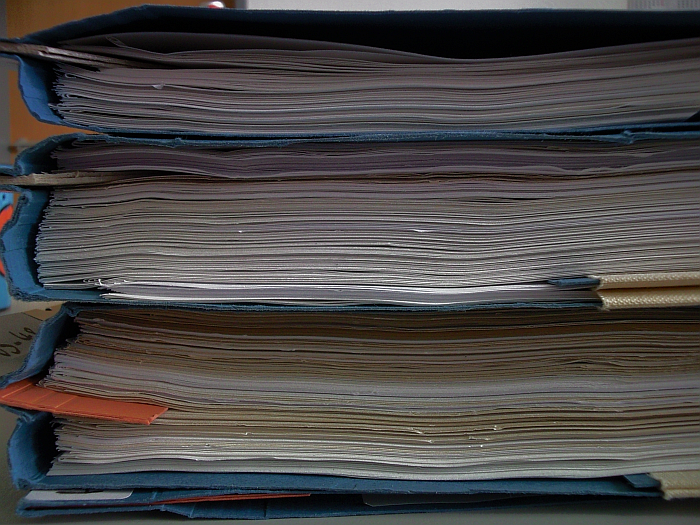 For most medical practices, a mid-level document scanner should suffice for EHR implementation. These devices range in price from $13,000 to $20,000, can handle robust workflows around 50,000 images per day at over 100 ppm, have automation features that help reduce staff workloads, and can be centrally managed on a computer network to help HIPAA compliance. Here are a few suggestions to consider. The Fujitsu fi-6800 is designed to image up to 60,000 pages per day, with a 500-page document feeder and 130 ppm capabilities. It comes with Paper Stream IP document management software, and is compatible with other document management software running TWAIN and ISIS driver standards. It is designed for network use, and can be set up for remote management, with status and alert monitoring to help your team stay compliant. The Fujitsu fi-5950 is the next model up, and has similar features with slightly faster performance (135 ppm). Kodak i4600 performs at 120 ppm with a 500-page feed capacity. It is designed to image 50,000 pages a day and has TWAIN- and ISIS-compatible drivers. A key feature is Kodak’s Perfect Page technology which lets users alter and automate color output, and “smooth out” paper inconsistencies in its scans—a nice feature to have when dealing with older documents that may have handwritten elements. The Kodak i4200 offers similar features at a smaller scale and price point under $1,000. It is the smallest mid-volume scanner in its class with a 500-page feed capacity, and it is able to image at 100 ppm with a recommended volume of 30,000 pages a day. The Panasonic KV-S3105C scans at 105 ppm with an unlimited daily duty cycle. It has a large, 1,000-page feed capacity, and is built to handle documents up to 100 inches in length, like electrocardiograms or well logs. It can be centrally controlled on a network, and comes with TWAIN- and ISIS-compatible management software in the box. Canon ScanFront 300P The 300-series scanners have key-in or list-type logon access, and the P-model offers added security with a fingerprint reader to verify registered users. These features come in addition to an administration tool that allows centrally-controlled network management, but these allow for added security where networking might be unavailable. It has a 30 ppm speed, a 50-sheet feeder capacity and 6000-page recommended daily cap, better suiting it for a smaller practice, or lower-volume use such as in a front desk or administrative environment. The clock is ticking to cash in on EHR migration, though medical practitioners should stay aware that patients will expect to access their medical records in a fast and secure manner. A document scanner is an essential tool for providing this level of care, and can help any practice save time, money, and energy as they move towards an electronic filing system.